Mount Pleasant Granary - Comments - Sunday 5th. April, 2015 – Easter Day. A picture of lunch in the village hall at Westruther -- a really happy occasion with food enough to feed the entire presbytery and still have some left over! This morning Mum and Rachel got up and drove to Gavinton for Easter Communion conducted by Jeff. I drove to Westruther for the service conducted by Tom Nicholson at which the Moderator spoke. It was a delightful family Easter Service with a considerable number of children in a well-filled church, with the congregations of Westruther, Gordon, Greenlaw and Legerwood (all Tom’s congregations) coming together for the celebration. 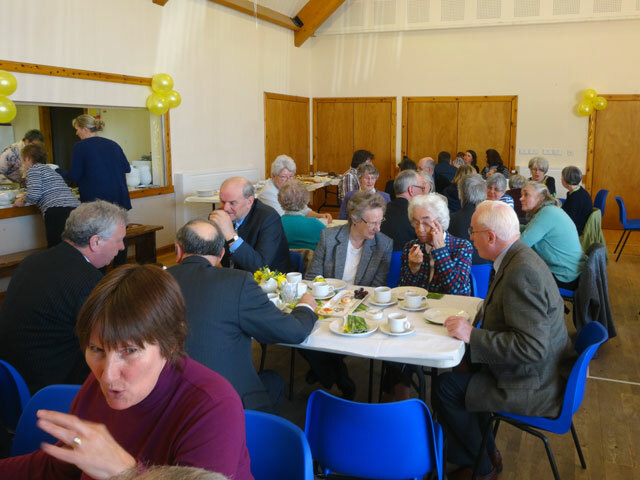 After the service, at which a long service certificate was presented and the Moderator gave a gift of a dove, most people moved across to the village hall for an excellent Easter lunch. Food was available in abundance and the company was excellent. I really enjoyed it and the day was helped by being a glorious one – sun and warmth and blue, blue skies. I drove home and found no one there as everyone was over at Scott and Sue’s for Easter lunch. They returned later in the afternoon for an Easter Egg hunt. I showed Katie all that we had been doing on the building front since she was last here and while I was doing that, Mix went on walk-about so it was panic stations everywhere. It was Rachel who eventually found him, being walked back along the road from Bogend farm by two women. I was in a total panic both because of the traffic on the roads and because of all of the lambs in the fields – but it all ended well: we are extremely fortunate. I went off and collected Stephen and together we drove to Kelso for the joint presbyteries’ Songs of Praise addressed by the Moderator and organised by the Presbytery of Jedburgh. It was a happy occasion with a good turn-out of the ministers from our presbytery and an appropriate end both to the Moderator's visit and to Easter Sunday, after which I drove Stephen home and returned to Mount Pleasant where it was soon time to walk the dogs before bed. It has been a very good day.